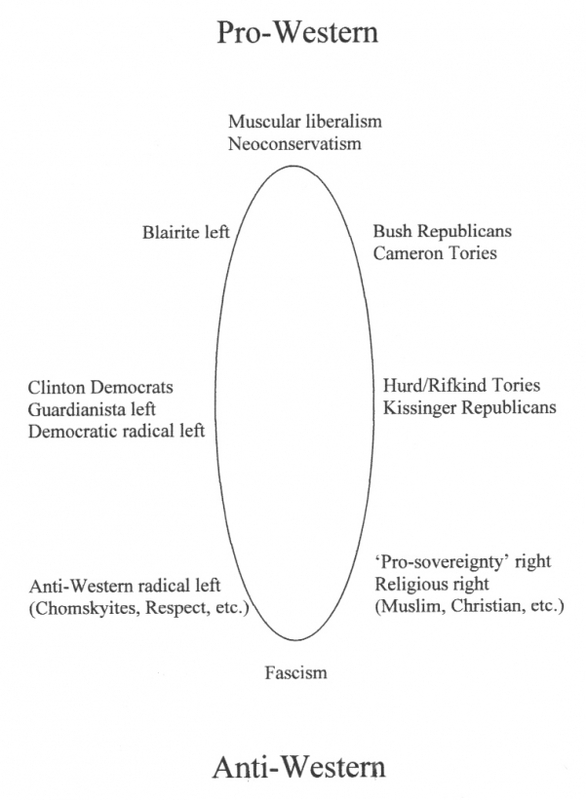 Political Alignment and Identity: Pro-Western Versus Anti-Western Now More Important than Left Versus Right? Thanks to Contentious Centrist and Bob for pointing me to this Ignoblus post which is commenting on a post by Marko Attila Hoare. To summarize, Hoare provided a diagram of contemporary political alignments (above). These alignments have less to do with left versus right (a dated but not entirely irrelevant paradigm) then pro-Western versus anti-Western. The triumph of the centrist political model has led to one section of the Left and one section of the Right breaking away from their respective comrades and joining up in opposition to this model: this ultimately takes the form of a Red-Brown coalition. Conversely, a second section of the Left and a second section of the Right have likewise broken away from the first sections and come together in support of extending this model globally. This, then, is the principal ideological division in global politics today: pro-Western vs anti-Western; globalist vs anti-globalist; the democratic centre vs the Red-Brown coalition. The essence of the division is that the pro-Westerners support the extension of the liberal-democratic order across the globe, through the politics of human rights, promotion of democracy, universal values and interventionism (not necessarily always military). The anti-Westerners oppose the liberal-democratic model, at least as a universal model; they admire or support movements or regimes that stand in opposition to the Western alliance or to Western values – all of which uphold religious fundamentalism or nativist nationalism, sometimes combined with a ’socialist’ veneer, as an alternative to liberal democracy. In simplest terms, ‘imperialism’ can be defined as a state’s pursuit of empire or the expansion of its power, through acquiring territory from, or power over, other states or peoples. No reasonable person would not oppose this, but ‘anti-imperialism’ today means something other than opposition to imperialism. ‘Imperialism’, in the eyes of the average ‘anti-imperialist’, is coterminous with ‘the West’, i.e. with the US and its West European and Israeli allies. As such, it is used to refer to the bloc of states that dominates the world today, and there is undoubtedly something emotionally appealing to the individual ‘radical’ in apparently fighting that which is all-powerful. As an eighteen-year old Trotskyist and ‘anti-imperialist’ at the time of the 1991 Gulf War, I can testify to the empowering sense of self-righteousness I felt as I demonstrated against the US and its allies, in the course of which my views became increasingly extreme: I fervently believed that the US-led intervention was by far a greater evil than Saddam’s occupation of Kuwait; that it would be a blessing for humanity if the US and its allies were defeated; that such a defeat would trigger revolutionary outbreaks across the Middle East and even in the West. I agree that it useful to analyze contemporary conlficts as between the forces supporting economic and political liberalization and those opposed to this opening. However, like Ignoblus, I am rather uncomfortable being lumped in with president George W. Bush. My political opponents on the radical left have often reduced my nuanced centrist position to that of neo-conservatism but there is no need for Hoare to fall into the same trap. After all, part of the appeal of the Euston Manifesto among self-described leftists was it provided an opportunity to be robustly anti-totalitarian (i.e. “decent”) without being right-wing or conservative. Hoare also ignores the existence of ultra-leftists, anarchists, and other self-styled revolutionaries who advocate a third perspective that is classically “anti-imperialist and anti-capitalist” while also critical of Jihadist terrorism. I’m refering here to Three Way Fight, World War 4 Report, etc. All in all, I find much affinity with what Hoare is writing on these issues and this diagram is a good first attempt at describing political alignments in the post September 11, 2001 era. I’m very interested in seeing Hoare and others develop these ideas further. For example, if muscular liberals are lumped in with neo-conservatives into some sort of political coalition, where does Hoare see the potential for political cleavages developing between these two groups? Well said Centrist. I also felt that Marko’s diagram was a bit too simple and didn’t really capture the differing positions between people on the muscular foreign policy left and their neo-conservative brethren, but it was a good first step (and created a lot of nice discussions) on this subject.